We are heartbroken to pass along the news that Chenoa passed away January 12, 2008 following surgery for a mass in her abdomen. Words cannot express how special Chenoa was and how much we will miss her. Rest in peace dear Chenoa. Hello. My name is Chenoa, which means "white dove." I am a small, beautiful, gentle and sensitive, spayed Himalayan girl. I am sweet, peaceful, loving and tender. I connect with people on a very deep and spiritual level. It's my body, not my heart and soul, that is affected. I am now a sanctuary rabbit here at SaveABunny, which means I will live my life out here. I have painful arthritis that needs treatment and some other medical conditions. 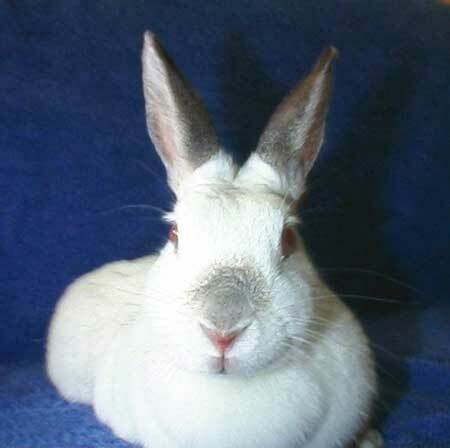 I will get the tender love and care that I need and deserve at SaveABunny where I have found security and safety.